The purpose is to connect the stones to the stone and thus escape to the centre. 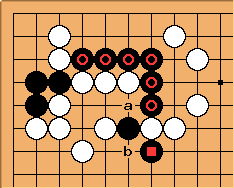 a and b are miai to maintain the cut. Therefore we need a move that somehow allows to get both points, which also threatens something else.